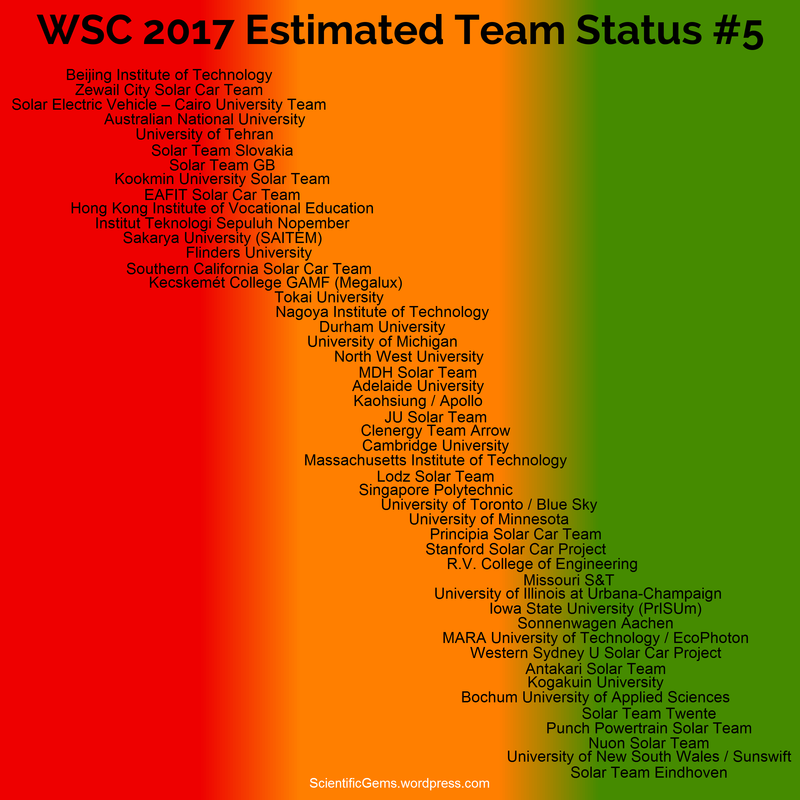 The infographic above (fifth in the series, and just a few days early) shows solar car teams that are likely to be entering in the World Solar Challenge this October, with my estimate of reported current progress (on a red–amber–green scale), taking into account recent social media updates. The team list has also been updated, and has a simpler traffic-light version ( ) of these estimates, together with more detailed news. As well as building a new car, Principia are gearing up to race an old one at the FSGP in July, so they must be rather busy. Bochum continues to blog in German, and report that they are using plexiglas for the windows of their new car. Nuon have announced that their new car will have an autopilot (OK, that last one was an April Fool’s joke). In general, teams should be well into construction by now. For some teams, I have seen no evidence that this is the case (which may simply mean that they are too busy to post). However, best of luck to all the teams! After my second harp post, I thought I’d keep going with some mathematics. In particular I want to answer the question: why does a harp have that shape? The physics of vibrating strings gives us Mersenne’s laws, which tell us that the frequency of a string of length L is (1 / 2L) √ T / μ , where T is the tension force on the string (in newtons), and μ is the density per unit length (in kg per metre). For a string of diameter d and density ρ, we can calculate μ = A ρ, where A = π (d / 2)2 is the cross-sectional area. Nylon has a density ρ of 1150 kg/m3. For a nylon string of 1 mm diameter, we get μ = 0.0009 kg/m. Putting 0.448 m (17.6 inches) of that string under a tension of 140 newtons (31.5 pounds force), we get a frequency of (1 / 0.896) √ 140 / 0.0009 = 440 Hz. That is, the string plays the note A. 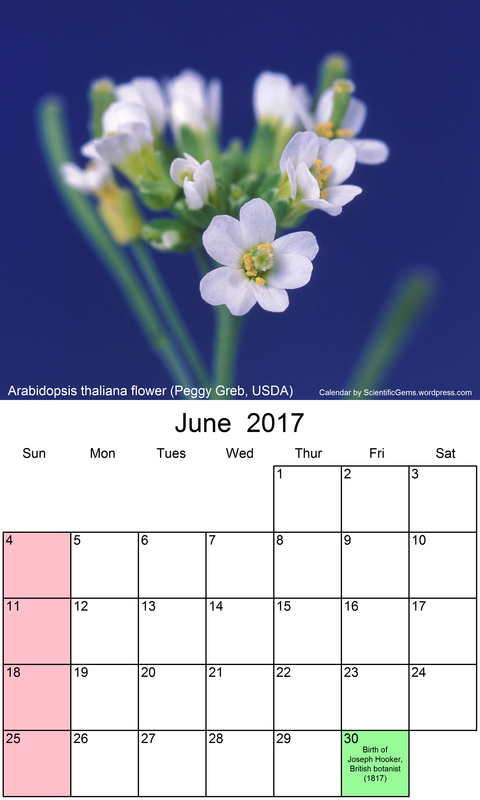 Image produced in R. Click to zoom. We can flatten out the curve at the top a little by changing the way we vary the strings (after all, a guitar manages to span 2 octaves with all the strings being the same length). However, we cannot eliminate that curve completely – it is the inevitable result of spanning so many octaves, combined with the mathematics of exponential growth. 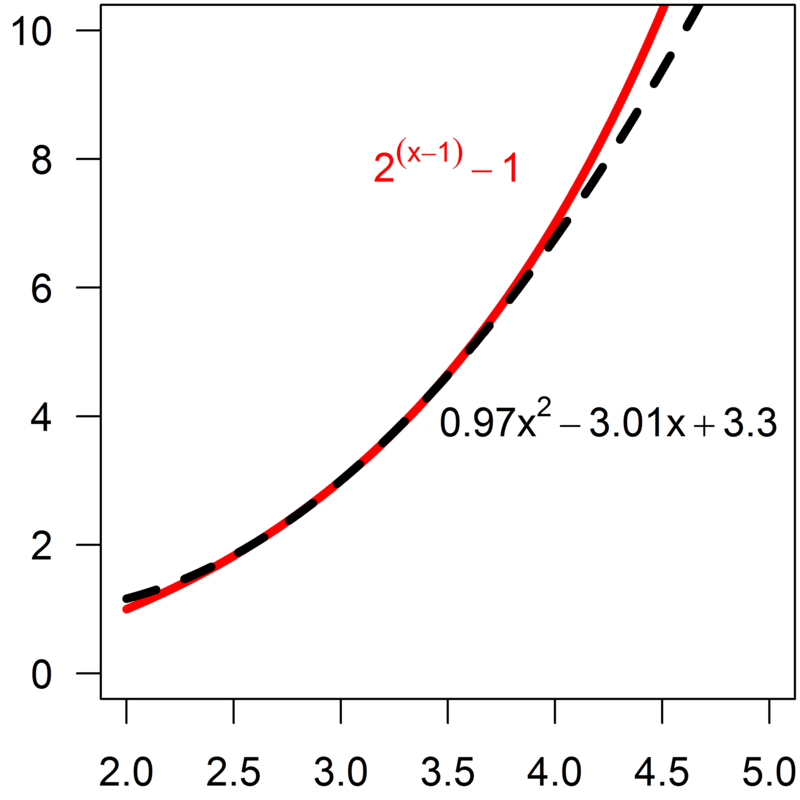 Left: an exponential curve (red) and a similar polynomial (dashed). Right: the quotient of the two functions (green) compared to a straight line (grey). Click images to zoom. Mathematically speaking, the modifications to the strings have the effect of dividing an exponential function by some kind of polynomial (as shown above). Over a short range of x values, we can find a polynomial that fits the exponential well, and gives us strings of the same length. 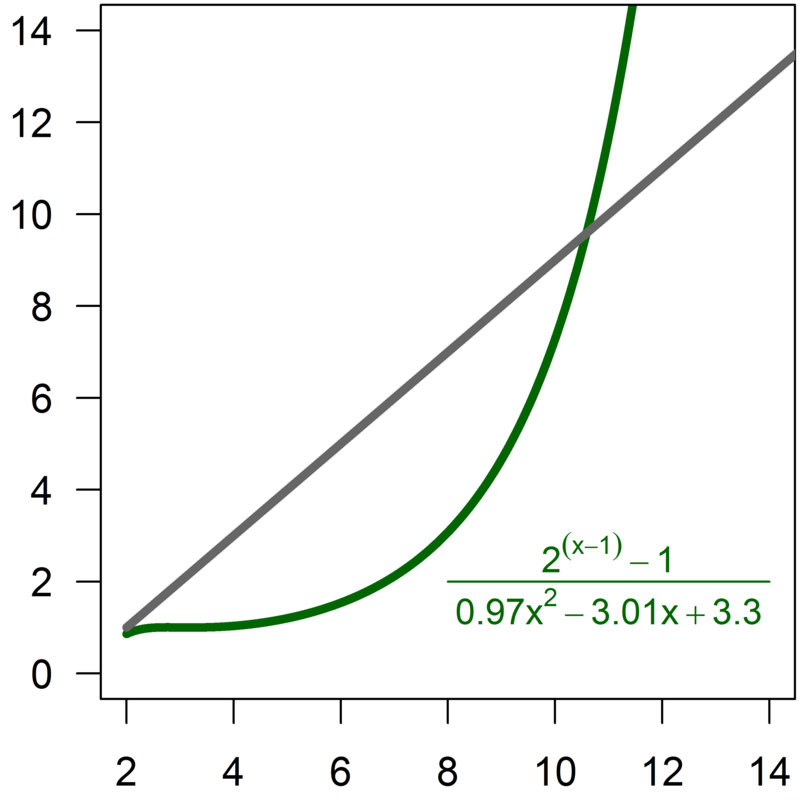 Over a wide range of x values, however, the exponential wins out. 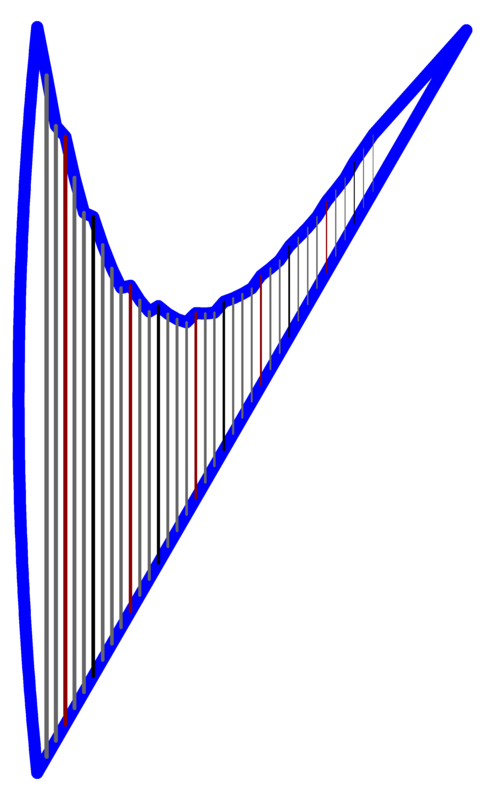 Furthermore, exponential growth is initially slow (sub-linear), so that (starting at the right of the harp), growth in string length is slower than the linear shift provided by the sloping base, which means that the top of the harp curves down. After a few octaves, growth in string length speeds up, and so the top of the harp curves up again. Please, let’s not have any “alternative facts” about Dante. 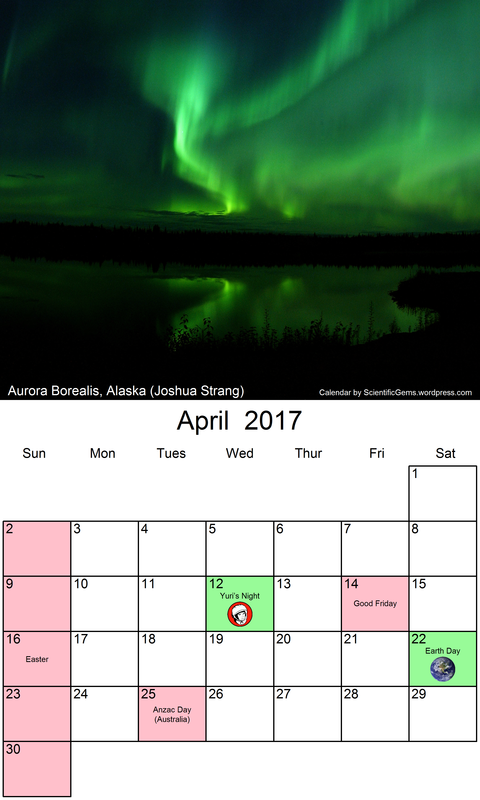 The climate of the Inferno is important too. 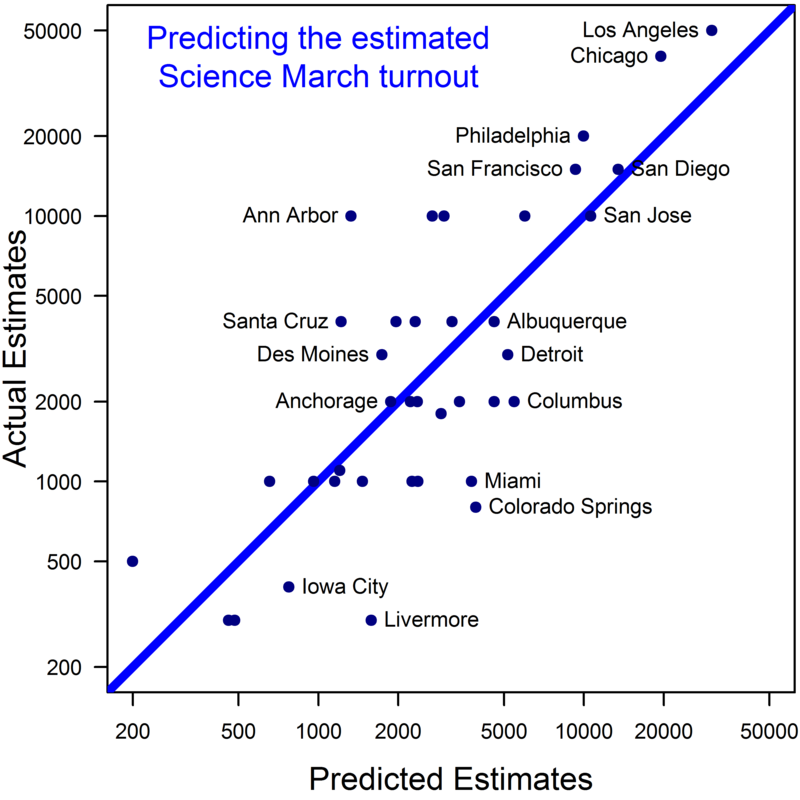 Further to my previous comments on the Science March, the graph below shows the (somewhat dubious) attendance estimates from Wikipedia for various cities (excluding vague counts like “thousands”), compared to the power-law predictor 0.47 D1.49 P0.78, where D is the fraction of the relevant state voting for Clinton last year (from Wikipedia), and P is the city population (also from Wikipedia). The population P predicts 56% of the variance in turnout (not surprisingly), and D an additional 7%. 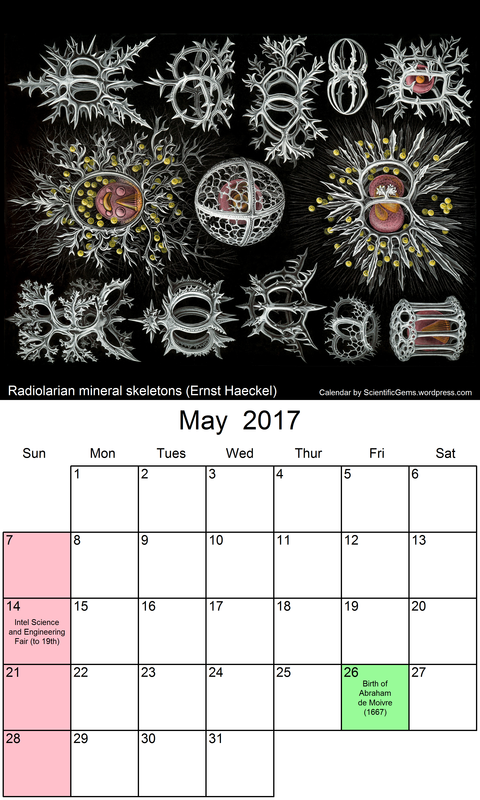 Both factors were significant (p = 0.000000055 and p = 0.014 respectively). Prediction could probably be improved by using metro area population numbers for the cities, by using metro area election results (rather that state results), and by adding factors indicating the number of other marches in the relevant state (Colorado Springs, for example, was rather overshadowed by Denver) and the presence of universities (Ann Arbor, for example, is a university town). But the basic messages seem to be: Democrat voters do not like Donald Trump and Large cities attract large crowds. It would be interesting to compare the numbers here against other recent political marches which focused on different issues.